Here's today's card for this week's CAS Challenge (CAS149) - Sketch by Charlene. I had a lot of fun doing my interpretation of Charlene's sketch. I changed the shape to a scalloped round card and made a matching envelope to fit. This set is made with all SU! products. Hope you like. 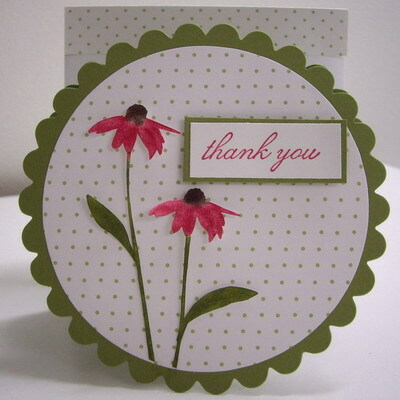 I inked the coneflower with Stampin' Write markers and stamped onto Whisper White cardstock, twice. I cut the flowers out and sponged more of the same colored ink over the images to darken them. I cut the leaf off of both flowers and glued it higher up (otherwise it would have been below the circle and not shown). I set them aside. I ran the polka-dot DP through my Big Shot with the circle die-cut. I ran two pieces of Old Olive cardstock through my Big Shot with the large scalloped circle. On one of the scalloped circles I scored a line 1/2" from the top. I folded the 1/2" flap down and used sticky strips to adhere the flap to the back the other scalloped circle, lining up the scallops, to create my card base. I mounted the polka-dot DP circle to the front of the card. The two flowers were mounted onto the card front, popping up both flower heads with dimensionals and securing the end of the stems with a dot of glue. I stamped the sentiment in Rose Red ink onto Whisper White cardstock, cut it to size and mounted it on a frame of Old Olive. I mounted the framed sentiment to the front of the card, popping it up with dimensionals to add depth. I made a matching envelope for the card ... click here to see the instructions from SCS. Yesterday I had a bake day with the crafty girls (Fran, Deb and Kelly). 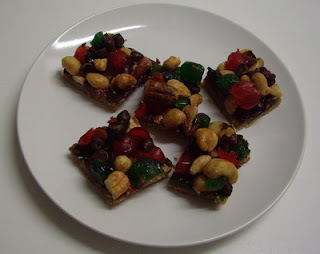 We made shortbread cookies, nuts and bolts, and jewel bar. It was fun! Thanks girls for coming over! I'm including a picture and the recipe for the Jewel Bar. They are so "Christmassy" looking (and delicious too)!